HE TRUE NAME of “Jeb” Bush is John Ellis Bush. 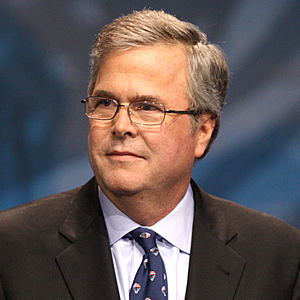 The nickname “Jeb” is for men with the initials J-E-B. For instance, a family friend’s name is “James E. Botega,” but we grew up calling him Jeb. Certain features of the Liturgy also don’t make “sense,” but are kept because they come from tradition. Tradition is important to Catholics. When we adhere to our sacred tradition, we honor our Lord in a special way and give testimony to the Church’s antiquity. A typical example of what I’m talking about is the Ite, Missa Est. This dismissal has a venerable history, although the first dismissal (Dismissal of Catechumens) fell out of use as the centuries went on. I have to be careful to limit my comments here, because (like so many other liturgical subjects) the Ite, Missa Est has a fascinating and complex history. As a matter of fact, the name “Mass” seems to have come from the dismissal. For our purposes, it is sufficient to mention that even after the Ite, Missa Est has been sung, the Traditional Mass continues with several other parts (Placeat, Blessing, Last Gospel) and some might argue this doesn’t make “sense.” If you want to learn more about the Ite, Missa Est, a good start would be Adrian Fortescue’s article. It would be annoying if a loud mouth yelled out “His name is John” after someone addressed Jeb Bush with his nickname. POPE EMERITUS BENEDICT reminded us in one of his books: “The Second Vatican Council did not reform the liturgy. It ordered its reformation.” In other words, the Council gave principles, but the actual reform was left to others. I’ve been deeply troubled recently, studying the polemical and biased account of this reform by Archbishop Annibale Bugnini. As time goes on, perhaps we can speak more about this. So much of the reform seems to have been haphazard, partisan, disorganized, and done by unqualified people who didn’t do their homework. “Change for the sake of change” (although contrary to Counciliar documents) seems to have been part of this. The Council was supposed to “update” the Church for modern man, right? Yet, many practices were brought back from antiquity (many of them invented, we now know) even though these had been abandoned for good reasons as the Church grew and theology developed. Many bishops and priests have suggested reforming the Reform, that is, bringing the current Rite into conformity with what the Second Vatican Council ordered. This needs to be examined. I’m not trying to be argumentative by using the word “polemical” to describe Bugnini’s book, but every time someone objects to his proposed changes he refers to “attacks” (his word) and this gets old really fast.